Recently a new automatic device that measures brachial-ankle pulse wave velocity using an oscillometric method has been developed. However, the practical significance of brachial-ankle pulse wave velocity measurement remains uncertain. The purpose of this study was to examine the association between brachial-ankle pulse wave velocity and symptomatic cerebral infarction in patients with type 2 diabetes. One thousand sixty six patients with type 2 diabetes were studied cross-sectionally. Measurements of brachial-ankle pulse wave velocity were made using the automatic device. 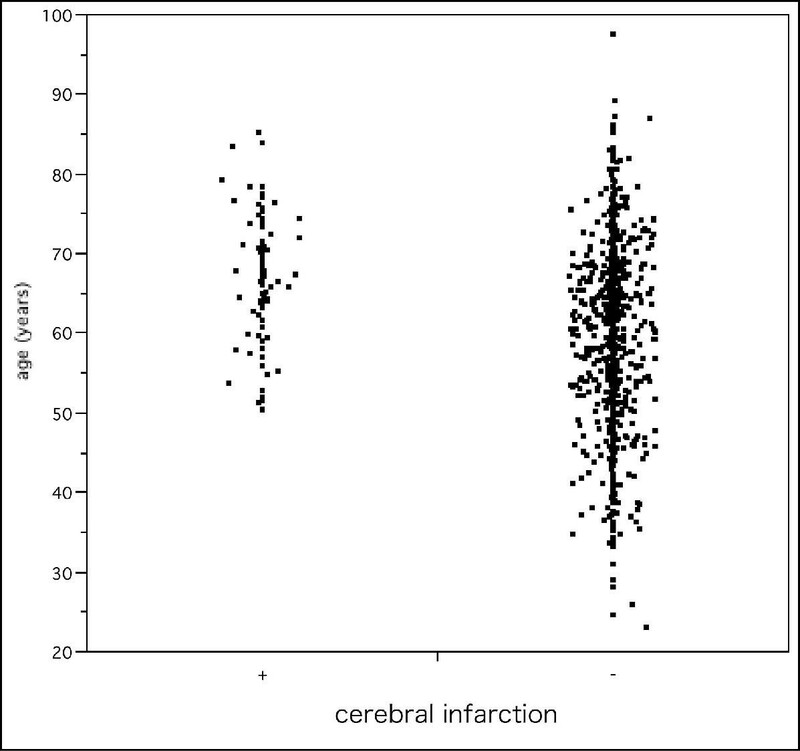 Logistic regression analysis was used to calculate the odds ratio for cerebral infarction. The presence of symptomatic cerebral infarction was confirmed in 86 patients. In these patients brachial-ankle pulse wave velocity was found to be significantly higher than in patients without cerebral infarction (18.94 ± 4.95 versus 16.46 ± 3.62 m/s, p < 0.01). The association between brachial-ankle pulse wave velocity and cerebral infarction remained significant after adjustment for traditional risk factors. There was an increasing odds ratio for each tertile of brachial-ankle pulse wave velocity, from the second tertile (odds ratio, 2.28; 95% confidence interval, 1.05 to 4.94), to the third (odds ratio, 2.53; 95% confidence interval, 1.09 to 5.86). Overall, we conclude that an increase in brachial-ankle pulse wave velocity is associated with symptomatic cerebral infarction in patients with type 2 diabetes. Pulse wave velocity (PWV) is the velocity of a pulse wave travelling a given distance between 2 sites in the arterial system. It has been reported that PWV gives an estimate of arterial stiffness, and an increase in aortic PWV has been associated with cardiovascular disease [1–4] Recently, a new, simple device to measure PWV has been developed. The device measures brachial-ankle pulse wave velocity (baPWV) using an oscillometric method. Unlike aortic PWV, baPWV includes measurements of peripheral artery velocity. Therefore, the clinical significance of baPWV may differ from that of aortic PWV. In order to assess the clinical significance of baPWV measurements, we investigated the association between baPWV and the presence of symptomatic cerebral infarction in patients with type 2 diabetes. Patients with type 2 diabetes who underwent measurement of baPWV between April 2000 and November 2002 at the outpatient department of Juntendo University Hospital (Tokyo, Japan) were enrolled in this study. Informed consent was obtained from all subjects. Clinical data were collected cross-sectionally from the medical records. Type 2 diabetes was defined as a fasting plasma glucose concentration of more than 7.0 mmol/L when no treatment was given, or a plasma glucose concentration of 11.0 mmol/L or more 2 hours after a 75 g oral glucose load when being treated with glucose-lowering drugs. Patients selected had no history of ketoacidosis. Exclusion criteria were an ankle brachial pressure index (ABI) <0.9, a history of ischemic heart disease, and a history of atrial fibrillation. Symptomatic cerebral infarction was defined as a clinically apparent focal or global disturbance of cerebral function, and was diagnosed by neurological examination and cranial computer tomography or magnetic resonance imaging. Total cholesterol, high-density lipoprotein cholesterol, triglycerides and hemoglobin A1c were determined using standard laboratory techniques. Weight and height were measured in the study subjects whilst they were wearing light clothing and no shoes. Body mass index (BMI) was calculated as weight (kilograms)/height (meters) squared. baPWV, ABI and blood pressure (BP) were measured using an automatic waveform analyzer (BP-203RPE; Colin, Komaki, Japan). Measurements were taken with patients lying in a supine position after 5 minutes of rest in that position. Occlusion and monitoring cuffs were placed snugly around both sites of the upper and lower extremities of patients. Pressure waveforms of the brachial and tibial arteries were then recorded simultaneously by an oscillometric method. Electrocardiogram monitoring was performed with electrodes placed on both wrists. Any arrhythmia recorded was evaluated. Heart sounds S1 and S2 were detected using a microphone placed on the left edge of the sternum at the fourth intercostal space. The pressure waveforms obtained at 2 different sites were simultaneously recorded to determine the time interval between the initial rise in the brachial and tibial pressure waveforms (T). The path length from the suprasternal notch to the elbow (La) and the path length from the suprasternal notch to the femur to the ankle (Lb) were automatically calculated based on the patient's height and were derived from statistical studies. baPWV was calculated using the formula baPWV = (Lb-La)/T. Measurement of right and left baPWV was obtained for an average of 10 seconds. The reproducibility of the baPWV measurements was high. In healthy subjects, the interobserver coefficient of variation (CV; n = 15) was 2.4% and the intraobserver CV (n = 17) was 5.8%. In patients with coronary heart disease, the interobserver CV (n = 18) was 8.4% and the intraobserver CV (n = 41) was 13.3%. In 12517 subjects who had no medication and no history of cardiovascular disease, multiple regression analysis demonstrated that age and blood pressure variables were potent, significant variables for baPWV. The average of left and right baPWV was used for analysis. ABI was calculated using the formula ABI=ankle systolic BP/brachial systolic BP. In order to assess the association between baPWV and cerebral infarction, we performed 2 statistical analyses. In the first, subjects were divided into 2 groups: those with and those without cerebral infarction. Clinical characteristics including baPWV were analyzed in the 2 groups. Continuous variables are given as mean ± SD. We compared continuous variables using the Student's t-test. We compared categorical data using the chi-squared test. A probability value <0.05 was considered statistically significant. In the second form of analysis, multiple logistic regression analysis was used to provide an adjusted odds ratio for cerebral infarction. The variables included in the analysis were risk factors for cerebral infarction and factors influencing baPWV, including age, gender, BMI, duration of diabetes, smoking habit, systolic BP, and hyperlipidemia (defined as serum total cholesterol concentration >5.7 mmol/L, triglyceride concentration >1.7 mmol/L and/or treatment with antihyperlipidemic agents). The odds ratio is presented with 95% confidence intervals. Tertiles of the mean baPWV, age and systolic BP were used for logistic regression analyses. Statistical analyses were performed using StatView-J 5.0 computer software (SAS Institute Inc. Cary, NC, USA). Of 1066 patients eligible to take part in this study, the presence of symptomatic cerebral infarction was confirmed in 86 patients. Table 1 shows the characteristics of the study group according to the presence or absence of cerebral infarction. baPWV, age, and systolic BP were significantly higher in patients with cerebral infarction than in those without. The frequency distribution of baPWV is shown in Figure 1. Scattergrams of age and baPWV in patients with and without cerebral infarction are shown in Figures 2 and 3, respectively. Characteristics of the 1066 patients enrolled in the study, divided according to the presence (+) or absence (-) of cerebral infarction. Plus-minus values are means ± S.D. baPWV: brachial ankle pulse wave velocity, HDL: high-density lipoprotein. Frequency distribution of brachial-ankle pulse wave velocity. 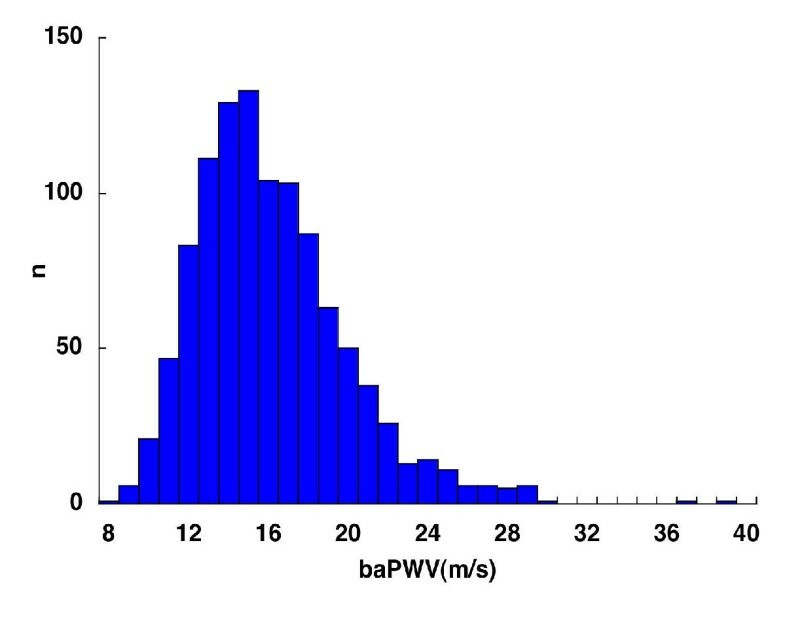 Bar graph showing number of patients with a brachial-ankle pulse wave velocity (baPWV) in each range. Scattergram of age. Scattergram showing the ages of patients with and without cerebral infarction. Scattergram of brachial-ankle pulse wave velocity. 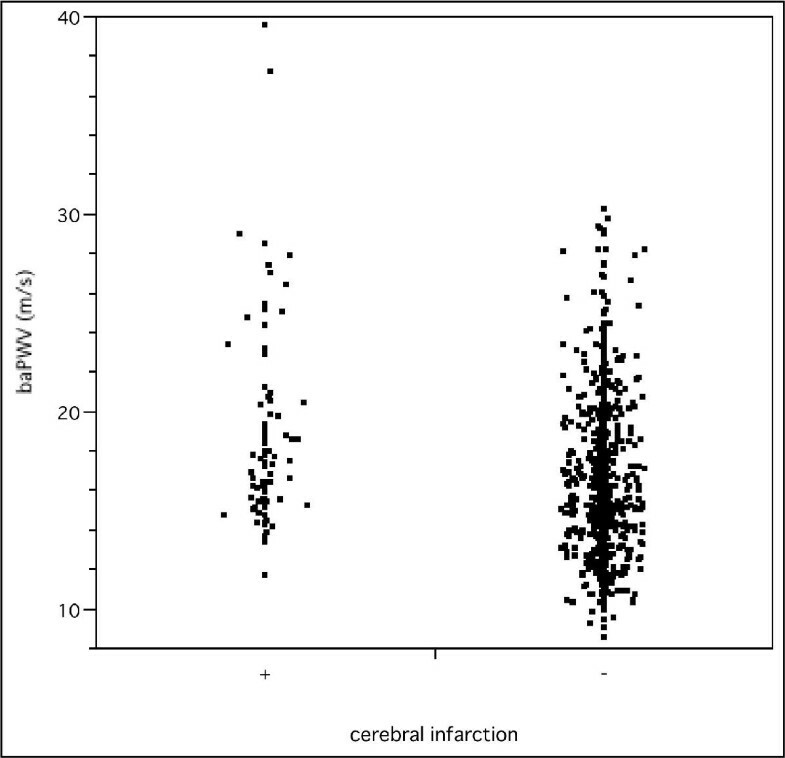 Scattergram showing brachial-ankle pulse wave velocity (baPWV) in patients with and without cerebral infarction. The adjusted odds ratios for cerebral infarction are shown in Table 2. The association between cerebral infarction and baPWV remained significant after adjustment for age, gender, diabetes duration, BMI, smoking habit, systolic BP, and hyperlipidemia. The odds ratios in the second and third tertiles for patient baPWV were significantly greater than those in the lowest tertile. The odds ratios in the second and third tertiles for patient age were also significantly greater than those in the lowest tertile. Systolic BP, hyperlipidemia and duration were not significantly associated with cerebral infarction after adjustment. Adjusted odds ratios for cerebral infarction. In this study, a high odds ratio for symptomatic cerebral infarction was associated with a high baPWV value, even after traditional risk factors for patients with type 2 diabetes had been taken into account. In a previous study, aortic PWV was shown to be associated with cerebrovascular disease. [1, 7] In addition, there was a good correlation between aortic PWV and baPWV. Our results support these findings. Cerebral infarction is commonly considered to be either atherothrombotic, cardioembolic or lacunar. Cardioembolic infarction occurs together with arrhythmias, especially atrial fibrillation. We excluded patients with atrial fibrillation; thus the cause of cerebral infarction in patients in this study would be expected to be atherothrombotic or lacunar in origin. Atherothrombotic infarction occurs together with atherosclerosis. Therefore, some patients with symptomatic cerebral infarction in this study would be expected to show atherosclerotic changes. In addition, as there was a good correlation between aortic PWV and baPWV, an increase in baPWV may reflect vascular damage. Aortic PWV has been shown to be associated with atherosclerosis. [9, 10] Therefore, baPWV is also associated with atherosclerosis. An advantage of this non-invasive baPWV measurement method is that it is simple: only a set of cuffs for each limb is required and patients need not remove any clothing. Also, the reproducibility of the baPWV measurements taken was high. Therefore, in clinical practice, measurement of baPWV may be a useful screening test for atherosclerotic change. The degree of elevation of baPWV may correspond to the degree of atherosclerotic change: a very high baPWV may indicate that the atherosclerotic process is already well established. The odds ratios of baPWV in second and third tertiles were similar, and did not increase linearly. This may have been due to an influence of blood pressure variables on baPWV  Additionally, the use of antihypertensive medication in patients with cerebral infarction may have decreased baPWV in this cross-sectional study. As with any study there were limitations to the present investigation. For example, since this was a cross-sectional study, it is unclear from our results whether baPWV is a predictor for cerebral infarction. However, baPWV is strongly correlated with aortic PWV,  and aortic PWV is a recognised prognostic predictor [3, 11, 12] Therefore, it is possible that baPWV is also a useful predictor. A further limitation of the present study is that we have only studied patients with type 2 diabetes, so any associations in non-diabetic subjects remain to be investigated. In addition, since measurement of baPWV may be affected by peripheral conditions such as a lower ABI, caution is needed when interpreting these results. A further prospective study of the general population would establish more clearly the clinical significance of baPWV measurement. The present study showed that there is an association between symptomatic cerebral infarction and a high baPWV value in patients with type 2 diabetes. baPWV may also be a useful marker of atherosclerosis. Colin Corporation, Japan supported this study by supplying the pulse wave analyzer. OO participated in the design of the study, performed statistical analyses and drafted the manuscript. TO contributed to the study design and revised the manuscript. SK carried out the measurements of pulse wave velocity and performed data collection. NM and CM carried out measurements of pulse wave velocity. RK participated in the study design and coordination.